Summer and fall months are a prime time to utilize door-to-door sales tactics. The weather is nicer, there are more daylight hours and households are more likely to stay up later, giving you the opportunity to present your sales case. Additionally, you have the ability to meet your customer face-to-face, demonstrate your product and its advantages, and the added benefit of creating face recognition. However, just like any sales tactic, there are many things to take into consideration and prepare for prior to getting started, and we’re here to help you put your best foot forward before you start ringing doorbells. Door-to-door sales can easily be compared to those dreaded public speaking classes you took in school. But, preparation and practice are all you need to have the confidence to sell. First, know your product inside and out, and how it compares to other like products on the market. This will ensure that you will have answers to any questions, and lets your potential customer see that you are the expert, thus giving them the trust they need to purchase from you. Additionally, you will be prepared for any bumps in the road and any unforeseen instances that occur. Second, practice, practice, practice! The more you know exactly how you will approach a customer, the easier and less stressful your sales pitch will be for you. It may be easiest to practice in front of a mirror, that way you can see how you appear to your potential customer, and change points in your pitch that may not come across like you hoped. The combination of preparing yourself ahead of time and practice will give you all the confidence you need to successfully sell. …and, I mean this in more than one way. In advance, think about the time you will start knocking on doors. Monday mornings are more than likely not the best option, as people may be on their way to work, dropping kids off at daycare or running errands leftover from the weekend. Try researching the neighborhood ahead of time, and note which homes have cars, and seeing who may be home during the day versus at night. Additionally, think about this as an opportunity to set a future appointment instead of selling. This will do two things: you will be able to prepare a meeting with the customer, and know that they are more than just a cold lead, as well as relieve the customer of any pressure of making a decision on the spot. It will also make you look very courteous, with the customer knowing that you were mindful of their time. Another thing to think about regarding time: how much time you need to spend with each household in order to meet your sales goals. Whether you want to make one sale a week or day, knowing how many houses you need to reach each day will give you a realistic target and will teach you how to manage your time with each home. When getting started, it is possible that the first 25 to 50 homes will include a lot of trial and error. That’s okay! However, make note of what works and what doesn’t, so you can change your game plan for future sales opportunities. Just remember to sell confidently and be flexible with your plans, and you can expect success to come along. What are your door-to door tips and tricks of the trade? What do you suggest for first-timers? Comment below so we can help everyone out with their sales plan! Many of you already know I’m a big believer in DISH U. Since the launch of the new DISH U, shortly after Team Summit last year, it’s grown and gotten better. Readers of the DOW Electronics blog know I’ve written about it and continue to see great value in it. Most retailers think of DISH U for their DISH-related training and that’s it. I find that so many are unaware that DISH U also has Professional Development (PD) courses available as well. These courses cover a wide variety of topics, outside of the DISH world, that retailers and their sales staff can benefit from. 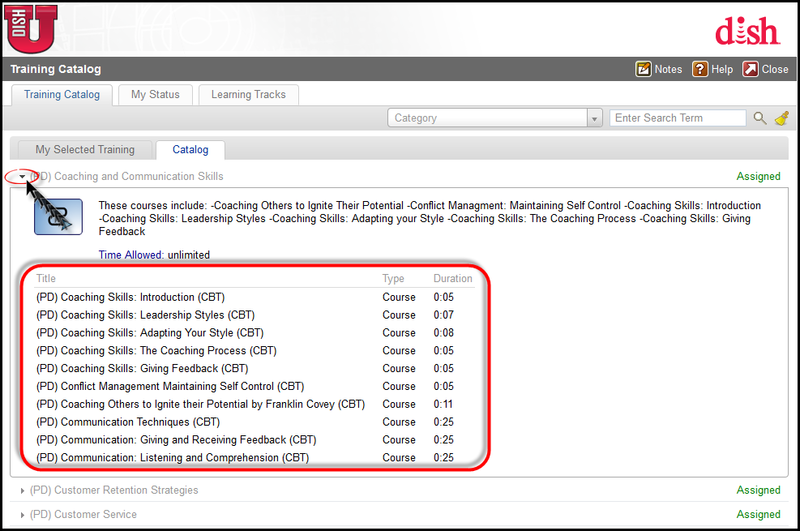 Different course modules are grouped together and called learning tracks. 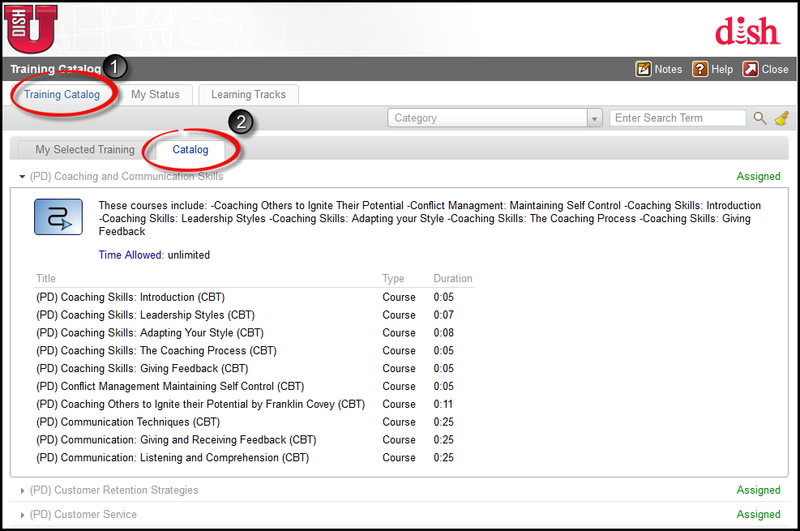 To access the different learning tracks, from the homepage click on the ‘Training Catalog’ link and then on the ‘Catalog’ tab. From here, you will see the overall learning tracks. Click on the triangle to the left side of the title to expand and see the individual courses within the track. Each track consists of courses that can be taken ‘on-demand,’ meaning you can start, stop, and return to the spot where you left off whenever you’re ready to being again. Most courses take less than an hour to complete. This past week, DISH U added some new and exciting PD tracks (see the RetailerNews DISH U® Offers New Professional Development Tracks – for FREE! document on DISHPortal for additional details). These include new tracks that touch on topics such as Coaching and Communication Skills, Customer Retention Strategies, and Time Management, just to name a few. Here are three tracks that I recommend taking as soon as possible. These, along with others on DISH U, can make an immediate impact on your business. Sales Skills Track – This track includes modules on understanding the benefits of consultative selling, conducting a needs analysis, and understanding customer expectations. Customer Service Track – Within this track you’ll learn about ways to earn customer loyalty, manage customer service challenges, and effectively communicate with customers. Social Media Track – Are you a little confused by social media and its place in business today? This track will help you understand how the two go hand-in-hand. The professional-quality content you find on DISH U would cost thousands of dollars if paid for out-of-pocket. Remember, these training courses are designed specifically for the DISH retailer regarding new offers, equipment and day-to-day operations, so I urge you to take advantage of the valuable training resources that DISH provides its retailers. Plus, there is a DISH U Mobile App, that allows for training on the go! Announcements will go out as content is refreshed and new modules are added and there is even a news feed that provides current DISH headlines. If you don’t have a DISH U training account, check with your account administrator. There are documents on the DISH Portal that explain how to create accounts for either you or your staff. As always, if I can be of assistance is this regard, please don’t hesitate to respond to this blog or email me directly at training@dowelectronics.com. What do you think of the new professional development content on DISH U? Is there anything you’d like to see added to the current roster of training tracks? Drop us a line in the comments section below! 2012 – The Year for Satellite Broadband. With 2012 coming to a close, we can all reflect on our businesses and the changes we have experienced. One change in particular stands out to me: 2012 was the year that satellite broadband became a solution that was applicable to all households, not just those that live in rural America. This change brought about new pricing and reasons for our retailers to sell this to all customers. ViaSat and HughesNet , the two largest satellite broadband providers, launched new satellites this year. This means our industry saw a change in technology, which allowed satellite broadband resellers the opportunity to compete in markets that were once out-of-reach for the satellite broadband industry. The launch of ViaSat-1 and EchoStar XVII gave satellite broadband providers the ability to offer speeds that rival that of digital subscriber lines and this improvement in technology and speed gave DISH Network the opportunity to provide their customers with a true television and broadband bundle in one bill. In October 2012, DISH Network launched DISHNet, their satellite broadband service. DISHNet’s variety in plans and speeds gave retailers the services their customers have long desired. I’ve included a small outline for the DISHNet services, when bundled with DISH satellite television. As you can see, the prices can fit any budget, so there is no reason why they shouldn’t be offered when you have a new customer walking in the door. DISHNet offers not only competitive speeds for customers and multiple options for different internet users, but a healthy revenue streams for dealers. With 90% of DISHNet customers also bundling their broadband service with DISH television programming, the bundle through DISHNet is a win-win for customers and dealers. As internet consumption continues to rise in the U.S., satellite broadband will continue to be a reliable and viable solution for retailers and their customers. With the technology changes, you can only imagine how much more technology will advance in the next year. Faster speeds, more competitive pricing and more data options are all feasible for the coming year, which only means better sales and better product/service for your customers. As the satellite broadband revolution continues to grow, they will only continue to face and overcome the challenges facing the industry regarding speeds, data and efficiency of equipment. Join in on the DISHNet parade (see video below) and get your customers running in for satellite broadband. What do you think about the satellite broadband revolution? How do you sell or promote these products and services to your customers? We’d love to hear your feedback! You’re invited to our webinar on Total Showroom Solutions! It’s official! We’re having our first ever retailer webinar and you’re invited to attend. Have you been thinking about upgrading your DISH showroom, but the thought of color palettes, laminate chips, and furniture shopping give you a headache? Fret no more! The professional and showroom of your dreams is now available for order from Total Showroom Solutions (TSS)! DISH Retailers now have an affordable opportunity to enhance their showrooms in just a few simple steps. With the help of Total Showroom Solutions, you can create a space that instantly defines your business as the authorized DISH Retailer in your area. Join our live webinar this Thursday for more information about TSS and how you can order a package for your showroom.